Time for a taste of the Canadian dream. After making it through the troubles of immigration, missing a flight, and sleeping on an airport floor, my adventure began in Prince George, British Columbia. The silver lining of missing my connecting flight allowed me to witness the vast landscapes of British Columbia from the air, I was surprised to see so much snow atop the mountain peaks. Dusting off my five years of forestry education I began to pick out various harvesting operations and fire ecology at in effect. The most striking thing about Canadian forests are the sheer scales. These were not the artificial plantations I had seen in the motherland but mixed species natural stands that held immeasurable diversity. My first shift in the Mugaha got off to a rocky start and I quickly discovered the realities of working in rough wet terrain covered in blow down and devils club. My first shift proved the need of a peculiar footwear called the caulk boot. Those spiked boots are really up for the task of walking on fallen timber! The role of forest manager and harvesting layout were both very different compared to what I would expect in the UK. Here the forest managers sub-contract the layout of harvesting blocks to consultant companies, such as my internship provider Strategic Natural Resource Consultants. 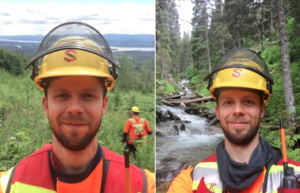 The role of the forest engineering consultant is to optimize a given area for productivity and balance the protection of the natural resources such as streams and wildlife features. This allows for flexibility of designing harvesting blocks sustainably, free from the arbitrary designation of a polygon feature on a map. Consequently, this takes a long, long time, especially when the block is essentially a giant matrix of streams and wet bits. Another thing to be mindful of is all of the local wildlife. There’s nothing like seeing a massive pile of fresh bear business to keep you on your toes when you’re out in the wilderness. 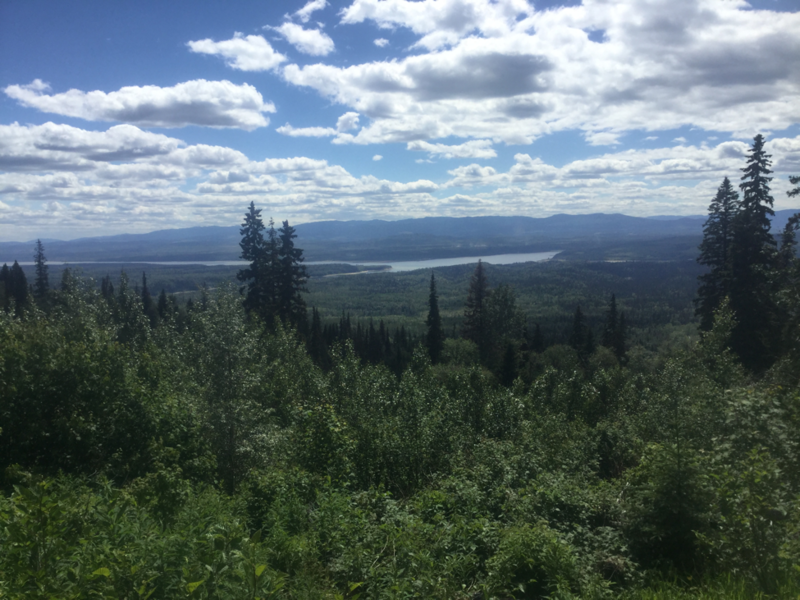 So far, I’ve seen many black bears and several moose, none of which have been hostile encounters. 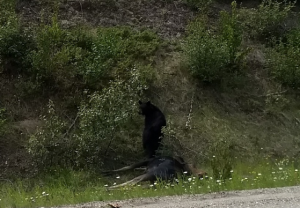 The most interesting was seeing a black bear protecting a fresh road-killed moose at the side of the road. 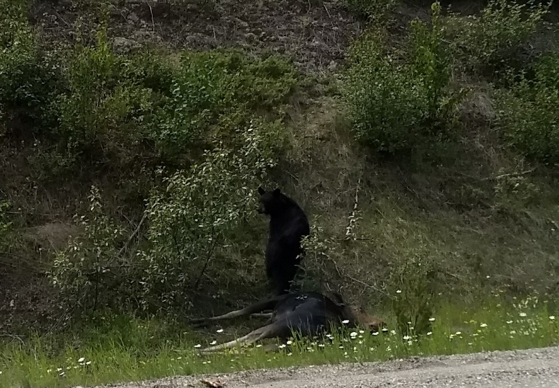 The black bear was more than willing to stand his ground against a massive Ford F350 full of fascinated summer students. Never get between a bear and his moose steak! Like home, it seems that spruce is king, favoured highly by the local mills. While hanging boundary we try, within reason, to grab as much as possible. The spruce in this part of the interior is a mixture of Englemann and white spruce, which I’m told is very difficult to distinguish between the two as they commonly hybridize. So, everyone just calls it spruce. Luckily, it’s not quite as spiky as its Sitka counterpart. The highlight of the trip so far has got to be my first helicopter ride! An experience few people back in the UK get to have, but it is a staple of land management here in BC. Disembarking from the cab on the edge of a scree slope without being fully landed was exhilarating, feeling the power of the down wash whilst the extremely talented pilot wrestled the controls. 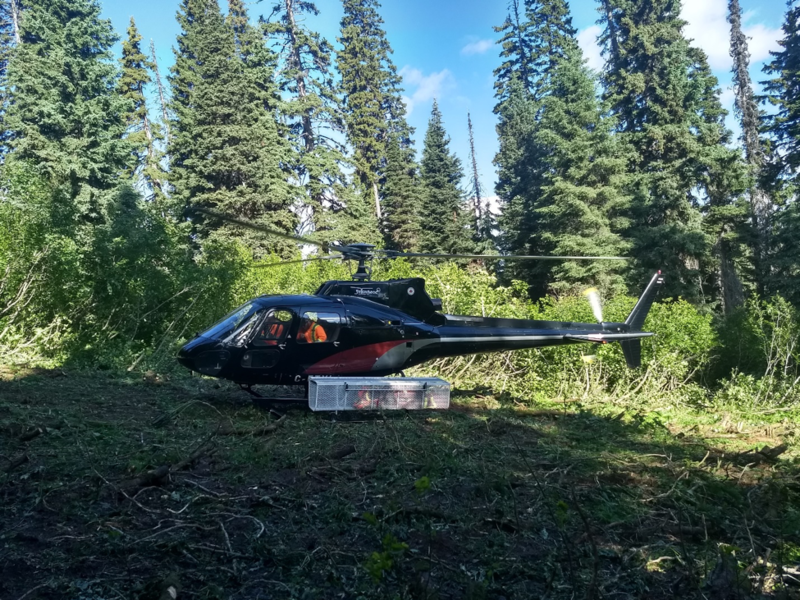 Then spending most of a day cutting a landing pad within the block through a patch of alder and seeing the pilot safely land on it was not something I ever thought I would do! After already completing my first month of this amazing experience I can’t wait to see what the future holds for my remaining time here. As long as it’s not encountering a grizzly!